Titan designed Coflexip Reel to perform transferring the Coflexip Flexible Pipe in different speed and adjustable tension. Equipment comes with telescopic design, this able to provide various angles during operation.It’s a compact design unit, portable for transportation and ideal for hazardous areas. Titan’s Coflexip Reel is hydraulic driven and available ranging from 1.25 to 3.5 inch OD. 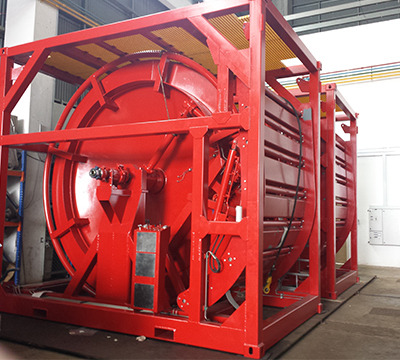 Titan’s design also able to cater for standard wooden coiled tubing drum and metal spools. 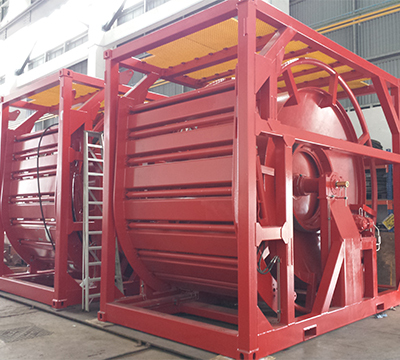 All equipment is manufacture as per DNV 2.7-1 standard. 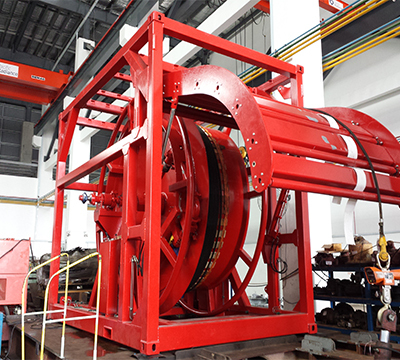 Titan designed Umbilical Offshore Reel to perform transferring the tubing and pipe in different speed and adjustable tension. Equipment comes with telescopic design, this able to provide various angles during operation. It’s a compact design unit, portable for transportation and ideal for hazardous areas. Titan’s Umbilical Offshore Reel is hydraulic driven and available ranging from 1.25 to 3.5 inch OD. Titan’s design also able to cater for standard wooden coiled tubing drum and metal spools.